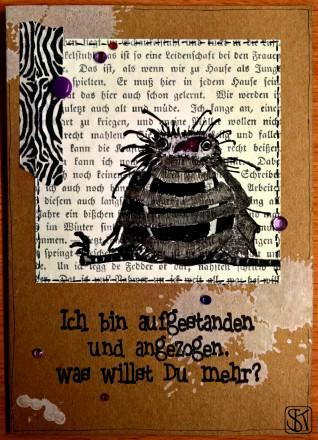 Schon wieder ein Monat rum… Zeit für ein neues Inspirationsbild von den Daring Cardmakers! Ich habe folgende Elemente aufgegriffen: Farben, Zebramuster, Text, Streifen. Another month has passed… time for a new inspirational picture from the Daring Cardmakers! I went for the following elements: colours, zebra-pattern, text, stripes. The text translates: I got up and got dressed. What else do you want? Do you know – I sooooo feel like your little bee today!